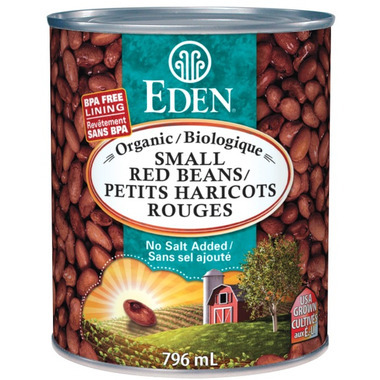 Organic U.S.A. family farm small red beans soaked overnight and thoroughly cooked at Eden's certified organic and kosher cannery with purified water and zero chemical additives. A dark red bean closely related to the red kidney bean, but smaller. One of the most popular beans in Cajun, Creole, and Mexican cuisine, a must for Red Beans and Rice and great in soups, stews, salads, and salsa. Rich in healthy fiber and a good source of protein, magnesium, and zinc. No salt added.